1 A few incidents only that merit your attention have occurred at this Presidency since our last advices of the 30th January, by the Grenville and Kent. 2 The extraordinary behaviour of your junior Servants was then explained to you as a point in which your interest is deeply concerned. They were at that time turbulent & factious; but we have the pleasure to acquaint you, that the conduct of the more inconsiderate seems now to be disapproved by those arrived at greater discretion, who begin to see the propriety of our determined resolution to reduce your Servants in general, within the Sphere pointed out by their years, standing and abilities. We must however observe, that your Service here hath always been carried on, rather from a dread of punishment, than a sense of duty; and that at present no branch of your affairs is conducted with that alacrity & zeal necefsary and efsential to your Interest, to which we would conceive your Servants naturally excited by the uncommon advantages they enjoy. 3 This decline of publick spirit must in great measure ascribe to a practice, which hath prevailed at this Settlement, more than at any other, of entrusting some of the most weighty employments in your Service to Gentlemen scarce arrived at years of maturity. The businefs of the Secretary’s department was committed to a youth of three years standing in your Service. The employment of Accomptant is now discharged by a Writer still lower in the List of your Servants. The important trusts of military Storekeeper, naval Storekeeper & Storekeeper of the Works were bestowed, when last vacant, upon Writers; & a Writer held the post of Paymaster to the Army, at a period when near twenty Lacks of Rupees had been deposited for months together in his hands. 4 We will not enquire, how far these employments have been duly discharged. Youth cannot argue dishonesty; but it certainly doth in general imply the want of sufficient discretion and experience. We will only observe that reposing trusts of so important and lucrative a nature in the hands of young men, hath rendered them too soon independent, and given birth to that Spirit of difsipation and luxury, of which you were very justly informed before the appointment of this Committee. 5 From this Source likewise flowed a grievance of the most serious consequence to your Service, which demands an immediate remedy. The younger Servants being incapable themselves to discharge the functions of their Several office were forced to have recourse to the Industry of their Banians & black Writers; and thus their employments fell into the hands of their Afsistants, Banians became principles in the several Departments, the affairs of the Company flowed through a new and unnatural channel, and your most secret concerns were publickly known in the Bazarre. Such trusts reposed in those Banians encouraged them to advance large sums of money to their Masters, which served no other purpose than to support their extravagance and render them dependent on their Servants, instead of being obedient to the Governor and the Council. It would be unnecefsary to set forth the consequences to a Settlement, circumstanced as this is, of placing too much confidence in the afsistance of the Natives. The frequent and imminent danger which you have lately experienced are evident proofs, that unlefs your more important affairs can be transacted by your own Servants, there never will be that dispatch and sevrecy, upon emergencies which are necefsary to ensure Succefs. 6 For this reason we have resumed to the Senior Servants, some of those employments which, we think, require the knowledge and Steadinefs of more advanced years; and also appointed a Committee to investigate the management, and inspect the conduct of the several Officers, civil and military, with exprefs authority to establish such regulations as may appear the most conducive to the publick Service. By these means we hope to see the principal branches of the Company’s businefs wholly transacted by your own Servants, without the aid of Men, who ought, as much as pofsible, to be excluded from all knowledge of your private concerns. 7 In the letter which we had the honor to addrefs to you by the Admiral Stevens, we took notice that too strict a regard to promoting Seniority will ever prove injurious to the Service; notwithstanding the rule is convenient and equitable under certain exceptions and limitations. An instance in confimation of our opinion now occurs. 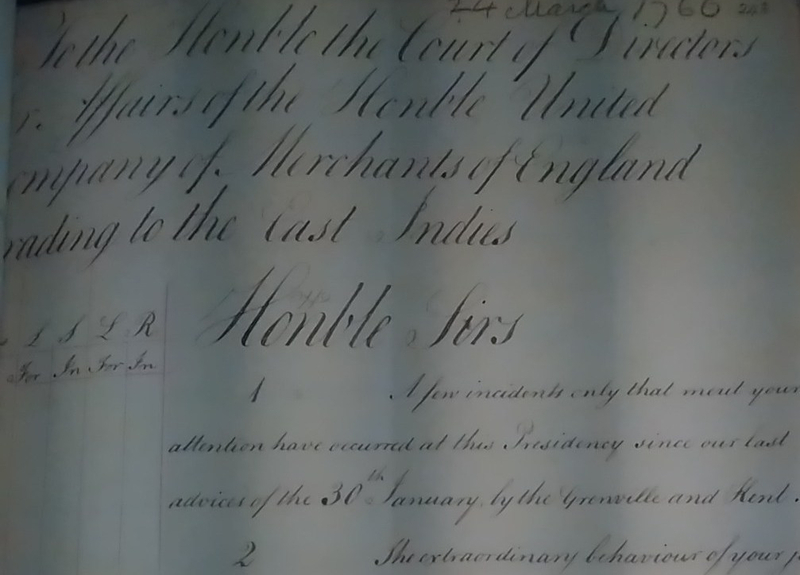 Upon examining the List of your covenanted Servants, it appears, that not more than four Gentlemen above the Station of Writers and below the rank of Council have resided in Calcutta for several months, we may say years past, to carry on the businefs of the Presidency. The rest have gone to Subordinates; for the right of succeeding as first, second or third in Council to vacancies at the out Settlements hath been considered as vested in Seniority; while the businefs of the Presidency was neglected, and nothing remained with the Governour and Council whereby to reward and encourage merit, without appearing to trespafs upon Justice.